We are back in Door County this summer. Week two is coming to a close, but my head is still very much here. It is beautiful, it is home in a certain way, and it is vacation–time together for my sweetheart, M, my daughter, N, and me. The past two and a half years in my job have taken a huge toll on my real-time connections to both partner and daughter and I’ve literally been at work and missed more of our lives together than I can really stand. My mom is with us for the whole trip and my sister, J, and her son, J-J, are on their way to join us tonight. We all love being with them. I have never stopped missing Lake Michigan since moving to the East coast. This big dose of looking at the lake at all times of day, while biking along the shore, driving, swimming and sitting on the sand helps me feel solidly connected to myself and to what is real and important. We’re in a rented house right in Fish Creek and on my bike we are less than 6 minutes (yes, I timed it) from the entrance to the Sunset Trail in Peninsula State Park. We spend a lot of our time in Peninsula State Park and counting all members of the family who are with us for any part of the trip, we join the other 999,994 visitors to the park this summer. The house we rented has been the perfect set-up for N in this phase of still-young-girlhood-and-now-a-teen life. There is a loft bedroom up a flight of stairs. The loft is her room and she keeps her stuff up there out of our sight and she stays up there for a few hours of “alone-time” at night after dinner and other times of day. From the living room I can hear her laughing while she watches silly you-tube videos and tv. Then she comes downstairs by her choice at about midnight (some nights well after I have gone to bed) to cuddle up and sleep. The teen and the young girl who needs her moms. My sister, J, came by herself last Friday night for the weekend. Even more than Lake Michigan, I love being with her. We do our own thing which includes getting up earlier than the rest and heading out for a look at the water and decaf cappuccino from the nearby café. She is training for a half-marathon and last Saturday morning I biked with her on a ten-mile run/ride as her water carrier and sag wagon. I have also fallen in love again with M on this trip. Not that I ever fell out of… but slowing down and being away from work has me able to feel why I loved her to begin with, why I love her now. We’ve been together so long now, have so many sweet memories of beach vacations together– with my sister and nephews and without, with daughter and before. Tuesday was the 2nd of only two rainy and cool days. I woke up desperately fearful, worried about what is to become of me in terms of work. My job, which I want to leave, hopefully to regain some flexibility and resume mothering in the way I want to, ends December 31. But until I have something secured, I’m once again facing the possibility of unemployment. I’m scared and often hopeless about finding a right spot for myself. The combination of sexism and ageism aimed at women as we push well past 50 is fierce and it often feels as though those forces will win this battle and my desire for good work that I like and feel respected doing, will lose. Those worries weighed heavily when I woke up Tuesday morning and I sat in the living room, twisting in my hard feelings. After a couple hours, as people were getting up, I figured that seeing Lake Michigan on a cool, windy, cloudy day and making my body work hard were the only ways out. So I biked alone to the state park and shore. I wasn’t exactly happy or hopeful, but I loved the dark gray choppy water, the wind, the hard work and loved being in my long-sleeved shirt, hoody and windbreaker. I arrived at Nicolet Bay calmer on the inside and spattered with gravel and dirt on the outside. I know I have a battle ahead– against my own insecurities and against the real live sexism that will try to thwart me. I wish I could wage it with mighty Lake Michigan (and these particular people I love) a lot closer, but these two weeks are a start. What I didn’t say: about work. I posted something several days ago and then pulled it back. The post had to do with stories that, though they affect me a great deal, aren’t my stories and I decided it was not the right time to share on one of the other people’s behalf. But this too is a bit about the theme of what-is-on-my-mind-that-I-don’t-write. There are things that come up that maybe cannot or should not be the subject of a blog post. Sometimes I don’t write because what I am not writing about is exactly the thing on my mind. There have been two such things, and the one will go up later. But not yet. Here is one other such thing. Work. My job, which was demanding but great fun and wonderful in some ways at the outset, took a big nose-dive for me in the spring, several months into it. It got hard then bad and then it got worse. I worked all the time and my boss grew critical of me. I became anxious. I would wake up every night in the middle of the night with my boss and my worries racing through my head. I would talk to my co-workers, those who had known my boss a lot longer, after some conversation where he berated and criticized me– and I would say “I think I am going to be fired” and one of my colleagues would shrug and say “if you are, you’ll find something else…just do your best.” This was honest but not reassuring. I was so thoroughly off balance and so thoroughly upset it was hard to figure out what to say about any of it. I said a little, but not the extent of it. Through the summer, which was emotionally terrible for me, I was convinced I would lose my job before the end of the year and I was terrified. Then some different things happened and things turned around. It was unexpected to me– so much so that the fact that things did turn around, even though I could not have seen it coming nor could I envision a way out just a few months earlier — was a lesson itself. This seemed an intractable, untenable situation. And then it turned about 180 degrees, despite my certainty that it could not possibly. What happened? I don’t really know, except that at the moment it is going very well. To some extent I just hit my stride. I figured out in the way you find your way around a keyboard or a new computer– just how to do certain things, even though what I learned and figured out was somewhat imperceptible to me. Some other things happened. I did well with my part of the work in the context of a very difficult situation facing my boss early in the fall. And there are some skills I have picked up that have always eluded me. I picked up the pace on certain kinds of work considerably. And at my age, I learned, in some ways for the very first time, to dig into certain projects immediately rather than later. Those two changes have allowed me to do certain projects and have given me a great sense of accomplishment and competence. And in view of the fact that a lot of my job involves writing, I think it is fair to say that I am developing skills I’ve never had as a writer. All of this, I love. So the anxiety is dialed back. What isn’t dialed back is the demand. I understand how to do many more things better and faster and more efficiently. But the demand has grown immeasurably too. And I feel the school year, and this 11- years-old-time with my daughter in particular, and with my partner flying by. So many evenings and weekends, I am not with them. Saturday before last I worked for 9 hours and then Sunday too. I’ve given up Fridays at home. My daughter is playing volleyball on a team, for the very first time and I don’t know that I will be able to see even one of her games. So I face a dilemma about how to parent and do my job and a dilemma about what I want. And I have very little time to think about it. Because I work a lot and then I come home to the other job I have, the one that is most important to me, and often most interesting to me– being a good mom and ally to my daughter. So the quandary is– now what? I don’t know but hopefully I will see my way clear to keep you posted. Weeks since I’ve written. 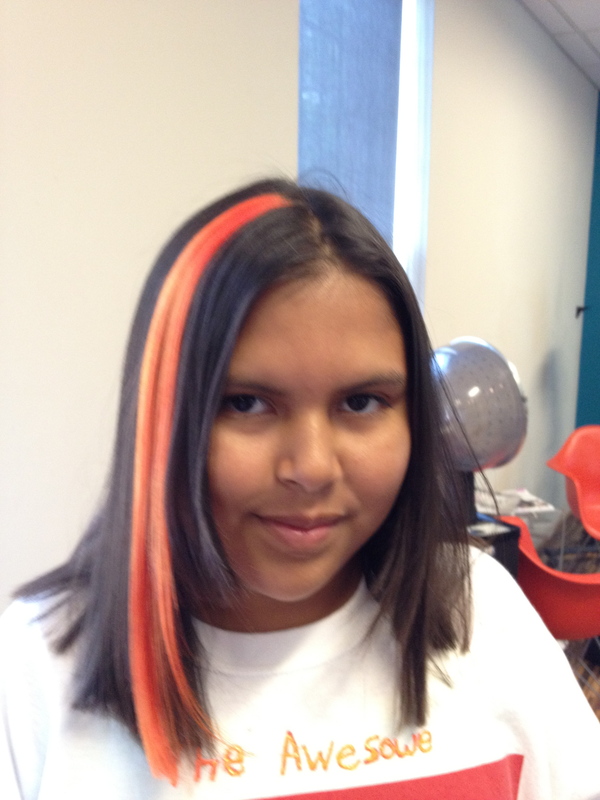 11 years old, urban hair. Someone is, many of you are– hanging in there with me, as I move back to the workaday world and into longer silences. I am appreciative. I have many things to tell, rejoice, laugh about and complain about. There are musings and things I am excited about– perhaps a few secrets to share. But I am teetering on the edge of a nasty cold– trying to stave it off– so I won’t write much here. Back at work after vacation, I look at and handle some beautiful, smooth rocks from Lake Michigan, now off the beach and on my desk at work. And I miss Lake Michigan and wondered when we returned to our city, to the East coast, I wondered again if we should move to Wisconsin. My sister says to me that having me close would be great, but that I need to remember that living in Wisconsin– dealing with work and daughter’s school and schedules and bosses, even very near her, would be nothing like being on vacation in Wisconsin. That much of what I long for when I return home is to go and be on permanent vacation in Wisconsin. That I do like the life of living with a group (my sister and mother and nephews high on my list) of people I love, the pack of young people around us keeping things lively, looking at the lake, being with my daughter, my parter, being outdoors all the time. My older nephew is back at school here and we had a lovely 24 hours together– labor day weekend with my daughter and one of her best friends. My partner was away in NYC giving care and attention to one of her very most beloved people who is going through chemotherapy. The day after 24 hours here, my nephew called to say he has strep throat, which explained, perhaps, his desire to nap here and to stay longer than we are usually able to hold onto him. All good– good to be the aunt-on-call for sickness and comfort. And in the last two weeks my daughter has started middle school. More to come on that. Much more to come. For now though, creativity and invention. Hers. Here was the key component of her back to school outfit. My beautiful and inventive girl. 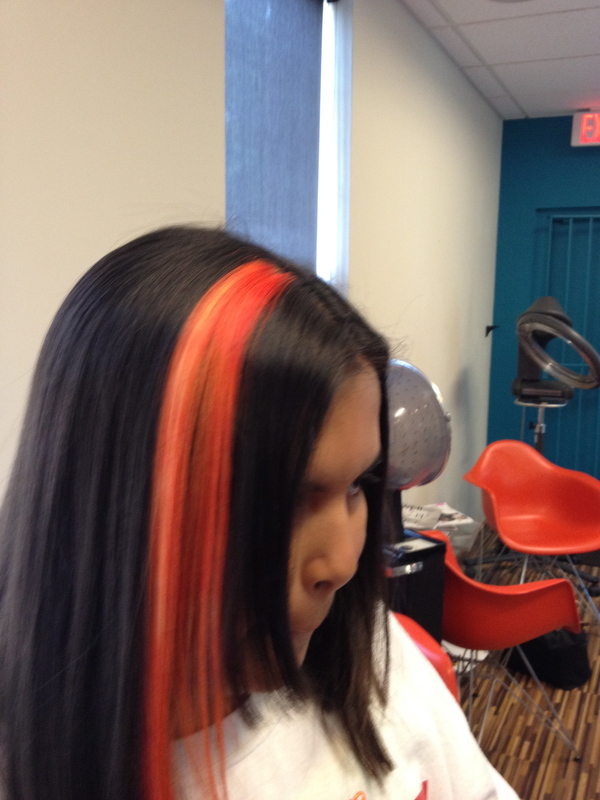 She wanted and we got, an orange streak in her hair. August 24, 2012. We’re now officially less than one month away from my daughter’s 11th birthday. I am pinned between the rock of her ever-increasing independence and growing up-ness (and all the complexities contained in that) and the harsh reality of having gone from a lengthy, not chosen, stint as a stay-at-home-mom who fell completely in love with that job, hard as it was– to a 50+ hours a week working mom. For those who equate tears and struggle with bad– you’d be hard-pressed to categorize how I am. I’m doing great, I’m thrilled, and I feel just awful a lot of the time, and this job, and the things I do at work are the most fun I’ve had in a long, long time work-wise. I mean really, serious fun. And I am, as I said just the other day– bone-tired. Since I’ve gained confidence on the job, and the first rocky, scary weeks of new-jobness have ended– I’ve turned my attention a little more outward. As a result, I have been bursting into tears quite a lot when I think of the hours and hours I am not getting to be with my daughter. I just can hardly bear it right at the same time I am loving what I do at work. If you could grant me the 48 hour day and she could sleep quietly while I work, I would, I think, be happy. But I cried with my boss on Friday when I realized I was going to have to work all day Friday and then a fair bit over the weekend. And I burst into tears when I walked through the door at home on Monday night at 8:30. I’d been at the very last of a series of in-the-evening community meetings. And then, at the very end, they decided to schedule another meeting this week that I have to staff– for 5:00 p.m. tomorrow. I literally barely kept it together at the meeting itself when they decided on a second this week. And I will work this weekend while daughter and partner go ahead on a long-planned camping trip to a gorgeous park on a river where it is nearly impossible to even get a permit to go there and camp. Me. I have to miss that. Aaaaachhh. I wasn’t actually with my daughter all the time when I wasn’t working. Sometimes I felt I was barely with her. She went to school and camp and Hebrew school and basketball and drama club and wanted playdates with friends and… she was busy. But I was with her a lot and I was available— and she knew it and I knew it. Being truly available to a young person is kind of like being together though nothing like being together. I’ve been walking around for days trying to pull up from some distant memory– or some non-existent memory, a phrase I believe I’ve heard, for what I am feeling. If after I write this, you know or want to make up the phrase– please do write me. Comment. It’s something like womb-loss or early-empty-nest but not really either of those. I mean by that, not either of those at all. Something else. It’s a phrase that connotes excruciating, tectonic plate-shifting loss even though it’s really change and not loss at all. Maybe the word I’m looking for is weaning, only it’s me who’s being weaned. She’s busy, interested in her friends, her iPod touch, her YouTube videos, something she calls “alone time”, nail polish, friends, art projects, wrestling, playing hard outside (sometimes) and a whole lot more. She misses me a lot, I know– she cried about it one night last week and I really felt terrible, like I’d let her down. But I miss her more, I really do, though it isn’t a competition. The fact is, this change has been hard on all of us, but then so are life-saving surgery, childbirth, writing and editing a book, starting a marriage or life with a new child, and training for a marathon to name a few. I’m not sure which of those I’m in the midst of, but you get the picture. I am bone-tired. My body, exhausted from working, which is on many days, and for hours and hours and hours– sitting and writing and concentration. And my mind is tired. I had brokered a deal whereby I could generally, except when something urgent was happening, not work on Fridays–so I could spend time at my daughter’s school and get her after school, but it turns out there has been something urgent every Friday but one Friday since I started. Yesterday I went into the office and worked and when I was sort of closing in on the end point, I realized had another big writing project due. So I went to the office of my boss next door and started to cry– “I have this wonderful 10-year-old daughter, she is my priority and I have to have more time with her.” She pulled out kleenex and told me to close the door and listened to me. Then I left and picked up my daughter and brought her back to work. I was so, so happy to see her. We stopped at a great downtown professional art supply store and at a food cart for a hot dog and then I brought her back to the office and stayed there and worked with her until 8:00 p.m. It helps a lot that I work in an absolutely beautiful building with a beautiful view out the window. It helps a lot that because I work in a legislative office I have a small 13-inch tv with cable in my office. Having my young girl come and sit in an office and watch me work for hours goes completely against my ideas about what a young person should get to do after sitting in school all day and against what a young one should do and get and have with a parent after that long day at school. It is completely contrary to what I want to do with her. Still, I realized yesterday that we had an especially sweet and close time together and it was a good thing for both of us. I loved going to work with my father when I was young, but by the time I was 10 I pretty much didn’t get to do that anymore. For her to see me and be with me and my colleagues at work. For me to have her with me even though I wasn’t playing with her, I was working. Hard. And I love what I do and she gets to see that. I have probably never, ever worked this hard at a job, except in the first years of my work at the HIV Clinic where I worked in the 90’s and on through 2004. In those first years we published a 300-page AIDS Advocacy Manual which we, the legal staff with caseloads and two legal clinics to run and other responsibilities, wrote and edited annually. At that time, the world, in terms of AIDS and the law– was changing so fast it was a big project, re-writing and researching things that had changed year by year. Then we decided it was just too much to do on top of our caseloads and my boss contracted with an editor. The other hardest job I’ve ever done was when I first graduated from college, I worked full-time as a daycare teacher. I worked with young people 1-2 years old and then later we had a mixed group of 1-4 year olds. I had to be at work at 7:00 a.m. and I was living and working in Madison, Wisconsin and for many of those months it was winter. It was cold, with a capital C and dark with a capital D when I’d leave for work. The work with young people was tiring because it was both physical– very. And it was work that demanded your mind– all those interested and busy and demanding young minds wanted a working mind in return. So it was non-stop physical and non-stop attention, and when I came home at about 3:30– I’d just lay down on our couch in the living room and sleep a deep and heavy sleep– for two hours before I could stand and do anything. Bone tired. But I love this job– for many reasons. The writing I get to do and increasingly the thinking. The breadth of the job and doing work that is rooted in my own geography, my community, the issues of the day in the place where I live. And as I get to know him better and better, the legislator I work for– who often stands against easy, angry opinion and does the right thing. Right now we are fighting hard to see if we can prevail against a tide of welfare cuts — the latest attempt to vilify poor people and to “balance” a budget if you can call a government budget that is so punitive “balanced”. There is more, but it is daylight now and a beautiful spring day this Saturday morning and I need to go and get out with that daughter I love– in her last weeks of 10-ness and move my body and breathe fresh air before it turns to the time I have to go back to work.